Krueger kneels beside the electric i Vision Dynamics concept unveiled at the Frankfurt auto show in September. The concept previews a potential Tesla Model 3 fighter. 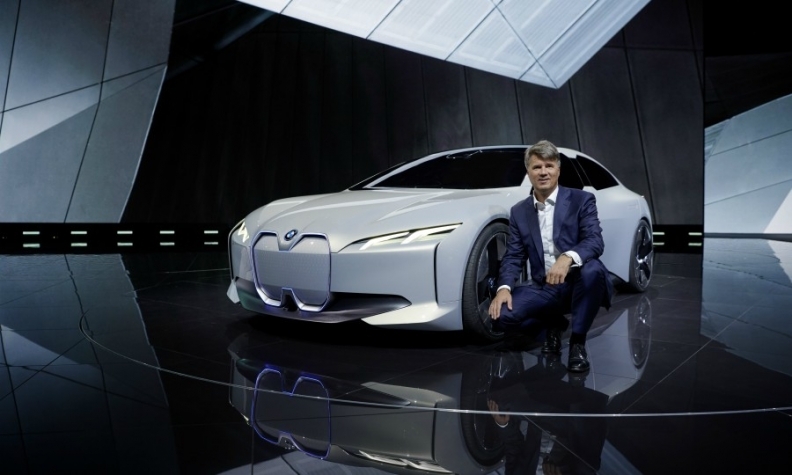 FRANKFURT -- BMW aims to more than double its sales of electric and hybrid vehicles to 500,000 by the end of 2019, CEO Harald Krueger told German weekly magazine WirtschaftsWoche. In 2018 alone, deliveries of electrified vehicles are to rise by a "medium double-digit percentage," he said. A pioneer in electric cars, BMW launched the i3 battery-powered hatchback in 2013 but sales have been relatively low and management has wrestled with whether to go all-out for electrification. But that changed in September when the automaker said it would gear up for mass production of electric cars and aimed to have 12 fully electric models by 2025 with a range of up to 700 km. BMW on Monday it had hit its target of selling 100,000 fully electric cars this year around the world, benefiting from strong demand in western Europe and the U.S. for models such as the i3 and the 2-series plug-in hybrid Active Tourer. Kruger said the carmaker would nonetheless keep making and selling cars with combustion engines to help finance a gradual shift to electrified cars. Unlike Volkswagen Group CEO Matthias Mueller, the CEO of Volkswagen , he rejected the idea of scrapping tax subsidies for diesel. "Bearing customers in mind who bought diesels, that is unjustifiable," Krueger said. Mueller earlier this month called for subsidies for diesel vehicles in Germany to be shifted gradually to incentives for green cars, such as electric vehicles. Acting Transport Minister Christian Schmidt had shot down the idea, though, saying that diesel was still needed during the transition to greener vehicles and there was therefore no reason to change tax rules.